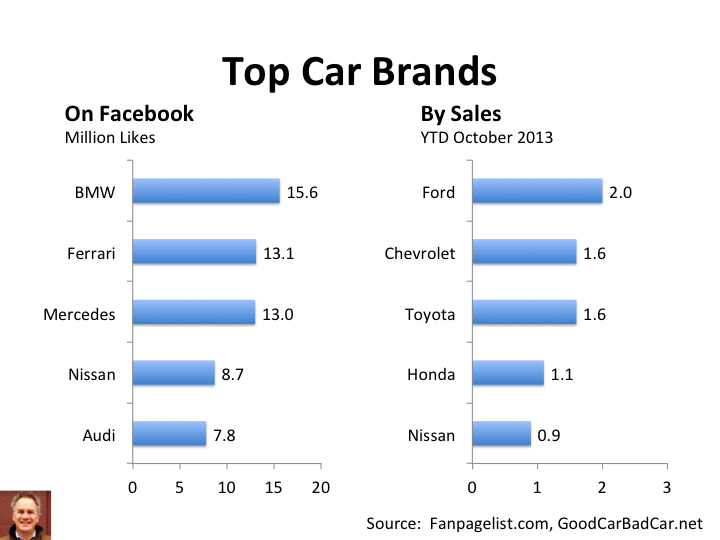 Why should anyone publicly like your brand? 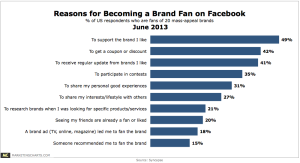 Why do people like your brand? As we noted earlier, a brand is a feeling. Put more reductively, it’s a blend of dopamine, serotonin, and other brain chemicals that get released when people recognize your brand. So on a certain level, the answer is simple: People like your brand because they like the way it makes them feel. If the data points they know about your brand are mainly favorable, they will feel good about it. If the data points they have add up to negative, they will not. So that may be why people have affection for the brand. But why do they publicly declare their affiliation for a brand by “liking” on Facebook or following on Twitter or sharing your content? That’s more complicated. Danah Boyd is a researcher (working at Microsoft these days) who did some of the first work on social media by studying teens on MySpace almost ten years ago. She found that the content that teens posted about themselves on their profile pages was “identity production.” Just like brands put out content to shape the market’s perception of them, we all put out content about ourselves to shape our publics’ perception of us. And those pictures can be different for different publics. For example, on Facebook, I share content that makes me look like a good Dad as well as being a funny guy, someone who likes certain styles of music, and someone who keeps up with the news. On LinkedIn, my brand is more focused around expertise in Media and Marketing. On Twitter, it’s a different take, more about current events and social media. In some forums, I have a pseudonym. None of these personas are inaccurate, but none are complete. We all want to look our best and to be well thought of by the various communities we belong to. One of the ways that people do that is by affiliating themselves with certain brands. At the top of the food chain, there are the most powerful brands. Some call them tattoo brands— Apple, Harley-Davidson, John Deere. 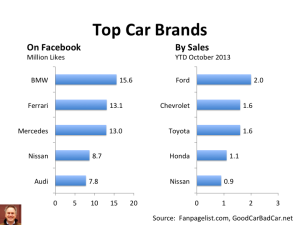 People join these brands rather than buy them. As Godin says, they become “a mirror on our identity as consumers, tribe members and citizens.” But most brands of any power will evoke a certain set of emotions. Your personal brand is a sponge, and it soaks up data about you—where you check in on Foursquare (church or trendy bar), whether or not you commented on a mutual friend’s update, what car you drive. People will publicly affiliate with your brand only if it makes them look good. They may use it in private, and even be a loyal customer, but never like you publicly. For example, I love Fritos corn chips, and have since I was a child. I try not to eat them much, but they are my favorite indulgence. But for me to publicly affiliate their brand with my personal brand doesn’t make me look good. Sure, maybe it contributes an element of childlike wonder to my personal brand, but it contributes more a sense of carbs, cheap snack foods, and lack of willpower. (Of course liking expensive wines sends a completely different set of signals—also indulgent, but with airs of connoisseurship and worldliness.) I may enjoy Fritos. But I’m not going to affiliate my personal brand with theirs. “Get coupons” is a price shopper. They’re not much good to you in the long run. They might sample, but as we know, they’re not loyal. “Receive regular updates” is the reasonable answer for someone who finds utility in information alone. That information could be delivered via an email. Or blog posts. But that’s not publicly identifying with the brand. 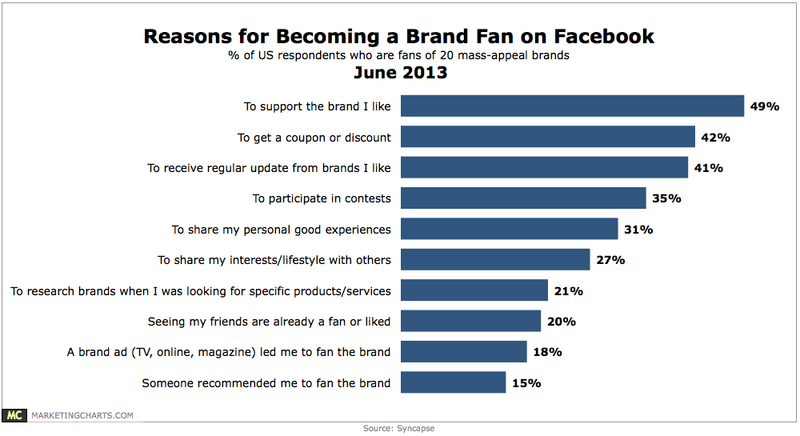 The largest number of people want to publicly affiliate (or “support”) their own personal brand with the brands they like. Identity production for grownups. A significant part of your success in social media will come from developing a brand that makes people want to affiliate with you—what sort of brain chemicals are released when your brand comes up? Are any released at all? If not, you know where to start building. You have to mean something before people will affiliate with you, and use you as part of their identity production.